The Prudent Life: The Best Poppyseed Dressing Ever! The Best Poppyseed Dressing Ever! 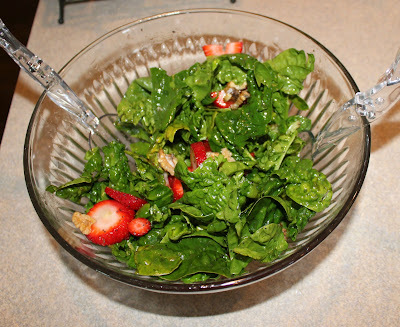 I found a recipe for Strawberry Spinach Salad that was really good, but the poppyseed dressing took a whole cup of oil. I decided to try to lighten things up a bit and the following recipe is my final version. It is delicious, inexpensive, and low-calorie (as salad dressings go). I usually use it for spinach, strawberries, and candied nuts but I imagine it could be used on almost any salad. I have been asked for this recipe often and even my picky daughter will eat it. Mix the ingredients together in a salad dressing shaker or in a measuring cup with a whisk. Add it to a fresh bunch (or bag) of Spinach, a cup or two of sliced strawberries, and 1/2 cup of candied walnuts or pecans. Yum! It is delicious! I calculated the dressing to be about 86 calories and 6 grams of fat per serving. NOTE: Candied nuts can be made by adding 1/2 cup of nuts and a 1/4 cup sugar to a frying pan on low heat. Stir until sugar melts and coats the nuts and then move to a piece of wax paper to cool down.